Linden trees (Tilia spp.) are deciduous trees with dense canopies and slightly heart-shaped leaves. 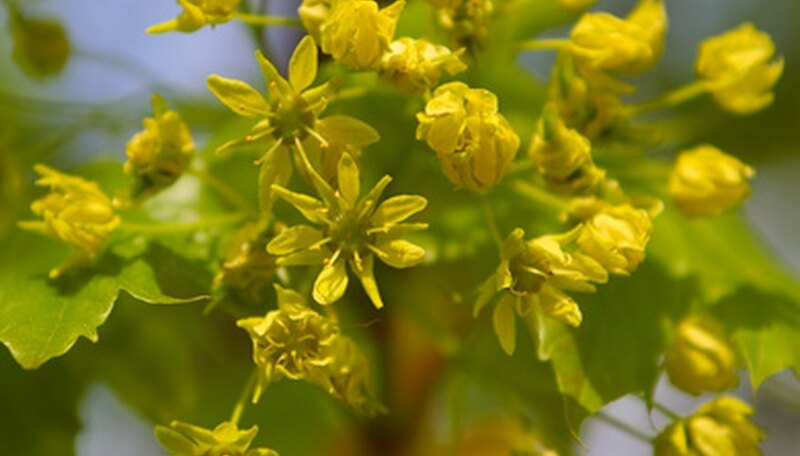 Lindens bloom in drooping clusters of yellowish-white flowers that are fragrant and appear in spring to early summer. Linden trees are popular landscape and street trees. One of the most common species in landscapes is the littleleaf linden (T. cordata), which grows 50 to 60 feet tall and 40 feet wide. Linden trees are susceptible to few diseases. To troubleshoot a diseased linden tree, you must first properly identify the disease that’s infecting the tree. Diagnose fungal canker diseases by inspecting your linden tree’s trunk and branches for growing callus tissues on the bark in a bulls-eye shape that appear during the spring and summer. Some fungal canker diseases grow quickly, rendering the tree unable to form the callus tissues, causing “diffuse cankers” that create shallow, discolored depressions in the bark. Identify powdery mildew by looking for a powdery white or grayish coating on the linden tree’s leaves, usually appearing in late summer or early autumn during periods of high humidity. Powdery mildew is a fungal disease that begins as round white spots on the leaves, growing to cover the entire leaf surface. Spot sooty mold by looking for a charcoal-black fungal growth coating the leaf surfaces, fruits, twigs and branches of your linden tree. Sooty mold is a fungal disease that occurs from wind-blown spores sticking to the leaves by adhering to honeydew, a sticky liquid secreted by insects like aphids, scales, whiteflies and mealybugs. Diagnose wood rot, the most common of which in linden trees is oyster mushroom (Pleurotus ostreatus), by looking for white, flaky rot and clusters of shelflike mushrooms that are 2 to 8 inches wide. The mushrooms are smooth on the upper surfaces, with gills on the undersides and stalks. The disease causes the heartwood and sapwood to decay. Treat fungal canker diseases by carving out the cankered areas in the trunk or large branches, removing all the diseased bark and wood. Water the linden tree deeply once each week when rainfall is less than 1 inch and apply a slow-release 10-10-10 NPK tree fertilizer in spring or fall. Troubleshoot powdery mildew by raking up and discarding all fallen infected leaves of the linden tree during autumn. Apply an appropriate fungicide, such as a product containing neem oil, Bacillus, potassium bicarbonate or sulfur, during cooler humid weather and according to the directions on the label. Manage sooty mold by removing the fungal spores from the leaves with a vigorous spray of water from a hose. Cure the disease by controlling the honeydew-secreting insects on your linden tree with an application of an appropriate insecticide, applied according to the instructions on the label. Treat wood rot on your linden tree pruning away all dead and diseased branches, making the pruning cuts to leave only the collar of ridged tissue connecting the trunk and branch. Water the linden tree and fertilize it to keep the tree vigorous and healthy. You're most likely to see wood rot on older linden trees. Wood rot typically occurs in lindens that have suffered wounds to the bark. Beware of spreading diseases or reinfecting your linden tree by using dirty pruning tools. After each pruning cut, disinfect your pruning tools by dipping them into a solution of 10 percent household bleach and 90 percent water for two minutes. UC IPM Online: Linden -- Tilia spp.